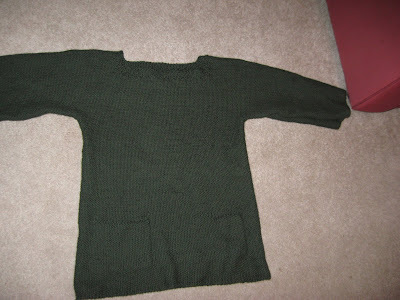 Okay, here's the linen stitch pullover. It feels nice on, but I need to wash it and see how it looks. Right now, I'm doubtful. I like the design idea, but maybe it needs a wool version. Sigh. 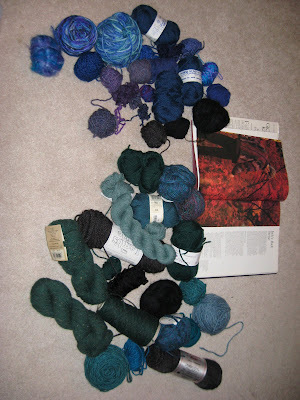 And here are the colors for Jack's Back and the picture from Fassett's book. Sorry it's sideways , I'm still at ends about loading things. And finally, here's my bali quilt inspired idea. Keepsake Quilting no longer has a picture of this, but a few years back there was a design for a window pane quilt (wrong term?) with mullions all in black and the windows were assorted bali fabrics. 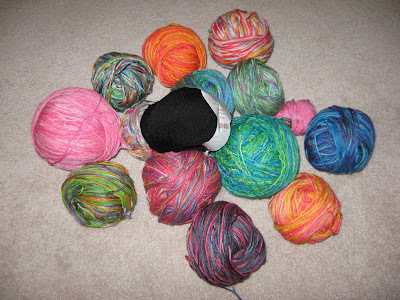 I thought it would be great as a sweater in Koigu, but I've sort of balked at 14 per skein when I'd need so many. So last spring, the little one and I did some dying.